Almost two decades ago I started my love for rangefinder cameras starting with the Yashica Electro 35. I’ve always coveted the Leica’s but couldn’t afford them so I went with the Contax G1 when it was time to upgrade and do more serious work. The G1 was a great little camera and worked well for what it was, but when the Contax G2 came out I traded in my G1 for the G2 and haven’t gone back since. The Contax G2 fixed the issues that I had with the G1 which was slow autofocus and also improved its Auto Exposure Lock and AF lock and the ergonomics were much better for me, as my hands are a little larger. Over the years, as I could afford, I bought as many lenses for this system as I could. Falling short with only the Contax 16mm F8 lens and the Contax 35-70 Vario Sonnar. In total I have 5 lenses the 21mm, 28mm, 35mm, 45mm, and 90mm. As I don’t shoot too much film anymore, I have contemplated selling the system, but my heart wouldn’t ever let me do it. I put so much hard work in purchasing that system, I felt it a waste to let it go for such little money. For a while the popularity of the Contax G system had a resurgence as new photographers noticed what great cameras these truly are, then again, I tried and subsequently failed at selling this system. As the years passed I wondered when I would be able to use these great lenses again. When I heard that the Sony NEX-7 was coming out with a rumor of an adapter to take these Contax G lenses, I was very excited. I know that Micro 4/3’s camera’s could use these lenses with an adapter but I was never happy with the M 4/3’s cameras out there. Also they made the manual focus very clunky, which didn’t make me happy. When I heard about the Sony and they way they would integrate the Manual focusing, I thought, finally this may be the one. How did it meet my expectations? Value to Cost wise I wanted to keep the cost of the adapter as low as possible. So I did a search on Ebay. I was very happy with the Adapter that I got for the Leica M mount to NEX that I got from Ebay, and I was hoping that it would be the same for the Contax G to NEX. The adapter that I got for the Contax G to NEX can be found here. It was the cheapest that I could find on Ebay at the time and my thought process was the same for this adapter as with the M-Mount adapter. I thought, it’s an adapter, there’s no glass to degrade the quality, as long as the adapter is made of metal and square, the cheapest one should be ok. There are many other adapters from Metabones, and Kippon, etc. that cost more and may be better made. This seller on Ebay was selling a generic version of the adapter, and is international, so it took a week to receive it, but that wasn’t a big deal. The adapter is solid, made of metal, and square. That’s the good part. 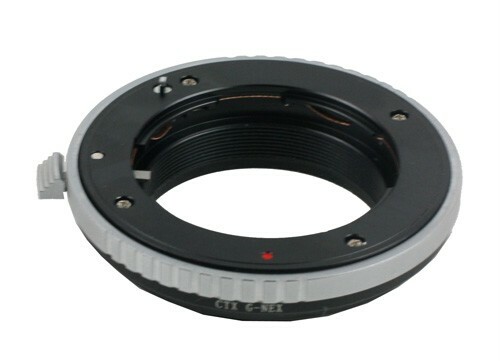 The Contax G series lenses were internal focusing lenses so on the adapter there needs to be a focusing ring that replaces the motor in the camera. On this adapter the focusing ring is a little loose. It’s not that bad, and I’m guessing, to save money they just used less or lower quality bearings. When you turn the focus ring you feel a metal to metal grinding feel. Also the lens release button gets in the way of focusing. I’ve seen pictures of the other adapters and its seems like a standard thing. For $40 compared to $100 I feel the quality is about right. It’s not the “value” that I got for the Leica M mount to NEX adaptor but I don’t feel that I got ripped off. I’m curious to see how smooth the more expensive adaptors are. Over all, the adapter is well made, fits tightly, works, and the only negative is the focusing ring is looser then I’m used to, and the lens release gets in the way. Price wise I feel that I paid what’s it worth. If you have any of the other adapters please use the comments to give me an idea of how you like it, and how smooth the focus ring is. Great review of adapter, been waiting to see reviews like thisl Are there any reviews coming with the Contax G lenses? Thanks again. Thanks Matt, Yes there will be some reviews on the G lenses! Looking forward to the results myself! I had this type of adapter, too, and didn’t like it. Now I invested for two Metabones Adapters (both in silver, which matches the finish of the lenses perfectly), and they are fantastic. They are expensive, large and heavy but have a wide focusing ring and run smoothly like warm butter. The best investment I’ve made. I don’t know whether they still sell the gold/silver version, because when I bought it, it was declared “limited”. The finish fits the golden/silver shine of the lenses perfectly. 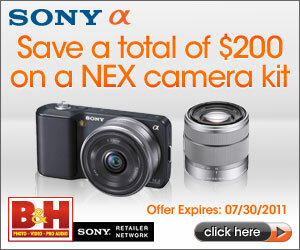 On the NEX-7 it looks less bulky because the NEX-7 body is bigger. There are a few videos on Youtube. One from metabones showing how to attach it: it didn’t work for me. It worked instantly when I mounted the adapter to the body first and then added the lens, finally take the adapter/lens off again and lock the lens with the lock slider. In another video on youtube someone complains that his adapter doesn’t fit. I think he just fails to mount it. It is a bit cumbersome but it works and when it is mounted once, it feels great. Karsten, Thanks for the info, Great info on the metabones adapter. I really appreciate it. Your images are beautiful. You say that you’re only a weekend photographer? I encourage you to shoot more. You have a very good eye and interesting points of view. Keep it up!!! This type of adapter has light leak from lens release tab. I have similar one from ebay made from china. I tried to test with LED light from the lens release tab and I can see light leaking. I think metabones adapter does not leak light. I do not buy metabones adapter yet because it is expensive and I cannot judge the price. Will, thanks for your comment. I heard this about this type of cheaper adapter, but thank goodness it hasn’t happened to mine yet! 🙂 happy image making!! !